34 the advertizer Auchenbothie by Douglas Forrest bishopton, langbank & bridge of weir bishopton, langbank & bridge of weir Bridge of Weir Tenants and Residents Association The latest meeting of Bridge of Weir TARA was well attended, and our thanks go to our three local Councillors, the Police and the Renfrewshire Wardens Service for their attendance. The Police report for the last month showed that there were a total of five recorded crimes committed within the confines of the village. These were, a burglary at business premises, a robbery and three road traffic offences. Three of the crimes have been detected. The Wardens Service report that there had been four reports for dog fouling in various areas of the village and that there were also two reports of fly tipping. One of the fly tipping incidents concerns the charity bin at the bottom end of Livery Walk car park, which we are informed by a member of TARA is there without permission and will be removed shortly. The main talking point of the evening however was the decision by McGills Buses to withdraw both the No 19 and No 8 buses as from the 24th March. The fact that residents of Bridge of Weir haven’t been given more than five weeks notice of the withdrawal of these services, and that no consultation had been forth coming prior to their decision is shocking. While the SPT are looking at alternatives and once more putting the routes out to tender, there is the real possibility that no one will take these routes on because they are not deemed commercially viable. This will leave the village having no direct route public access to Paisley, the centre of local Government, and the commercial hub of Renfrewshire. And what of the people from Bridge of Weir who work in Johnstone, Paisley and Inchinnan who rely on the No 19 for transport? Some of them could be facing a three bus journey to and from work. We hope there will be some kind of resolution to preserve these public transport links. There have been a number of issues regarding gritting coverage this winter and the misuse of grit bins for litter and dog waste. There has also been a lot of blocked drains which have caused flooding across many roads. If you have a problem with either, please contact your local Councillors, or why not come along to a TARA meeting and air your views. The next meeting of Bridge of Weir Tenants and Residents Association will be on Tuesday 20th March at 7.30pm in the Pirie Centre, Freeland Church. bishopton, langbank & bridge of weir Bridge of Weir Community Council Bridge of Weir Community Council has reached its quorum of co-opted members and as others have shown an interest in joining, we, now under Renfrewshire Council rules announce an interim election for new members. The process will involve formally intimating an announcement of an Interim Election to fill vacant places at the Community Council meeting in March. This will be followed by nominations from 19th March until 30th March. It is anticipated that numbers nominated will be fewer than the maximum number allocated for Bridge of Weir as no Community Council elections have occurred in Renfrewshire since 2001, however if the numbers nominated exceed the maximum then election will be called and administered by Renfrewshire Council Officials. Posters and nomination forms will be placed at various locations in the village and can also be had from our Chair who can be contacted at sandyclark01@ live.co.uk you can also follow Bridge of Weir Community Council on our Facebook Page for any up to date information. If you want to help provide a better Bridge of Weir now is the time to volunteer. At the February meeting there was a large turnout of visitors attending and many of their concerns referred to roads issues that included what is the long term programme for road maintenance, the supervision of contractors carrying out road and pavement works, gritting in the village or rather the lack of. Places of concern, Livery Walk Car Park and Shopping Centre, and Main Street pavements. Issue was raised to the number of potholes appearing especially after previous maintenance and the method of repair carried out during wet weather fill in’s. The poor condition of pavements on Kilbarchan and Prieston Roads was also reported. Due to the number of complaints received the Community Council will invite The Head of Roads to a meeting soon. The Police in attendance informed the meeting that if you suspect a vehicle has been abandoned call 101 however due to the process it may take some time before removal. The Planning Convener reported that the Bull’s garage site planning application was progressing slowly. A clothing bin has appeared at Livery Walk car park which once again is causing inconsiderate people to dump rubbish in the surrounding area. We were asked if we had any involvement in the bin being in place, as we do not, we will contact Renfrewshire Council to see if they have given permission for the bin to be there and if not will demand its removal. Our Renfrewshire Councillors reported on a number of matters, Kilbarchan Road is to be resurfaced in the next programme of capital works, looking into problems with street lighting on Hazelwood Road, Riverside View street lighting adopted by Renfrewshire Council and chasing up repairs to the traffic calming Safety Island on Kilmacolm Road. Two Community Councillors agreed to attend the Flight Path drop in session in Johnstone Town Hall, they will report back to the next meeting prior to us making a submission to the consultation. The next meeting of the Community Council will take place on Tuesday 6th March at 7pm in the Cargill Hall. 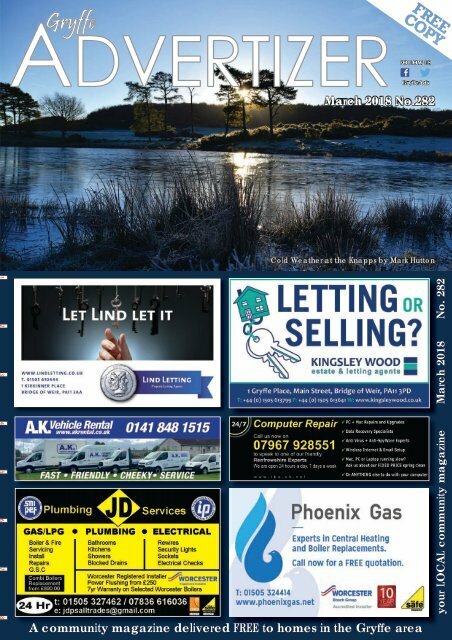 Your Ward 11 Councillors ... for Bishopton, Langbank & Bridge of Weir deadline date for our april issue - Friday 16th March - You don’t want to miss it! !